In a couple of previous posts I mentioned having problems with my original Snow Leopard hackintosh install. Most appeared to be related to permissions, with certain settings reverting after a reboot. For example, I change the background colour of my finder windows to grey instead of white, and every time I restarted this would change back to white again. I also always got a few unrepairable permissions errors when using Disk Utility’s repair function. Nothing major, and while everything important worked fine there were enough minor irritations to start me looking at an alternative install method. The motherboard and processor are over two years old now but still working fine. I have been tempted to upgrade to one of the newer Intel Core i5/i7 processors for some more video encoding muscle, but keep holding off in the hope iLife 10 will make full use of Grand Central Dispatch and OpenCL to give a big performance boost. There are currently two other main install methods using either a boot CD or copying the install DVD to a flash memory stick. I started looking for Boot CD’s and soon found the GigabyteOSX install disk. This has since been renamed Kakewalk, and now supports even more Gigabyte motherboards and one from MSI. My motherboard isn’t in the supported list but the hardware is close enough for it to work just fine. I haven’t tested the CD with any other hardware so far, but will eventually give it a try with my Home Theatre hackintosh which is still running 10.5.8. In my first Snow Leopard method I used the Chameleon bootloader installed to the EFI partition, so this time I tried something different. 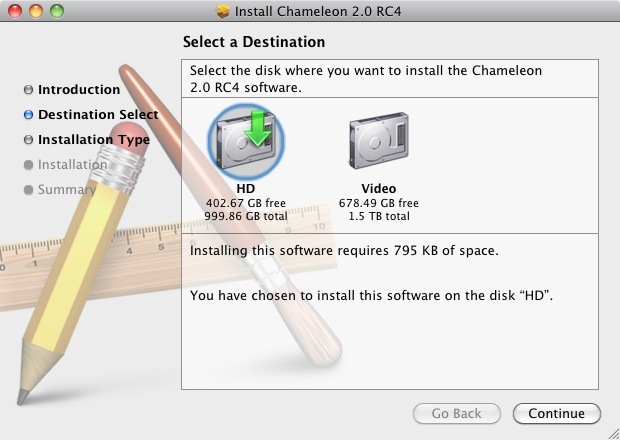 Chameleon 2 RC 4 is the newest version at the time of writing, and the installer here was used which installs to an Extra folder on the Snow Leopard partition. This means the boot files are easier to get to without having to mount the EFI partition. It also means they get backed up when I make a bootable image copy. The other advantage of using a Boot CD is no longer having to use an existing install to start the process. It’s quicker than my previous method and so far seems to have less issues. 1. Make a backup. I’ve recently had a hard drive fail and the OSX install became unbootable. Disk Utility couldn’t rescue it, and neither could Techtool as the drive was physically failing with numerous bad sectors. I had a backup, so very little was lost and it didn’t take long to get beck to the previous state. I use two 1Gb drives for my OS disk, with one running and copied to the second every week. I erased one for the new install then had the worrying though that everything was now on one hard drive until the user account was copied across. Next time I do a reinstall I plan to make a second backup before starting. 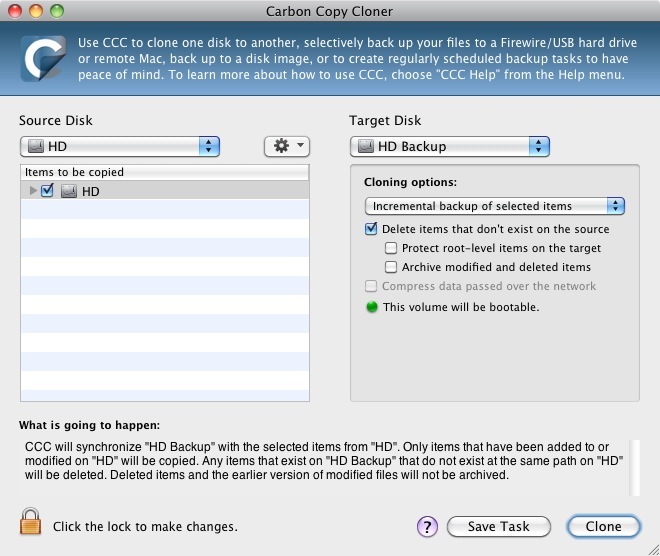 There are two apps I have used for making bootable backups of a drive, SuperDuper and Carbon Copy Cloner. Superduper is free for complete whole drive backups and $27 to enable Smart Updates (only copy changed files), scheduling and other advanced options. Carbon Copy Cloner does pretty much the same as SuperDuper but makes all its abilities available for free, with a donation is suggested if you like the app. 2. Next shut down the computer and disconnected all hard drives except the one being installing to. There’s nothing worse than erasing the wrong drive and having to spend time recovering data. 3. Boot from the Kakewalk CD. 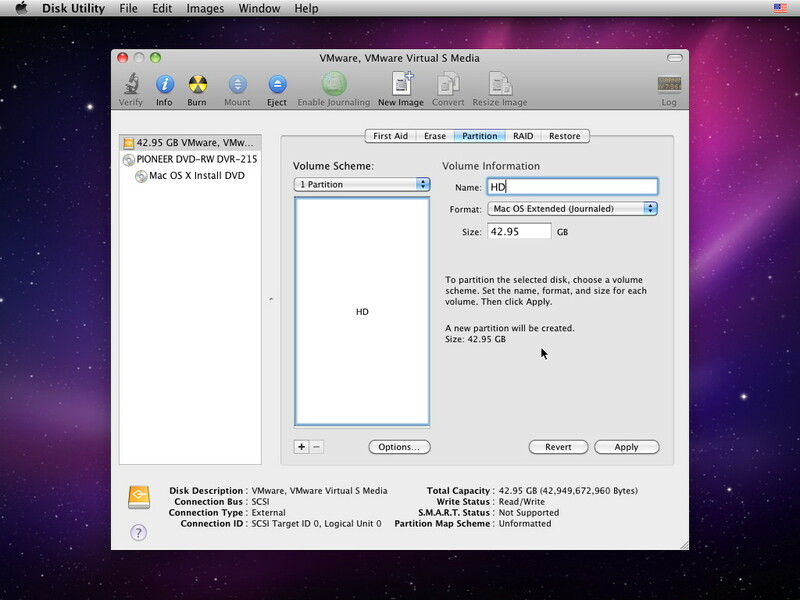 Once the screen showing bootable partitions is shown, swap the Kakewalk CD for the 10.6 install DVD and allow the optical drive to read the disk. Press F5 to refresh then select the Mac OS X Install DVD. Once the install disk has finished loading select the installation language. 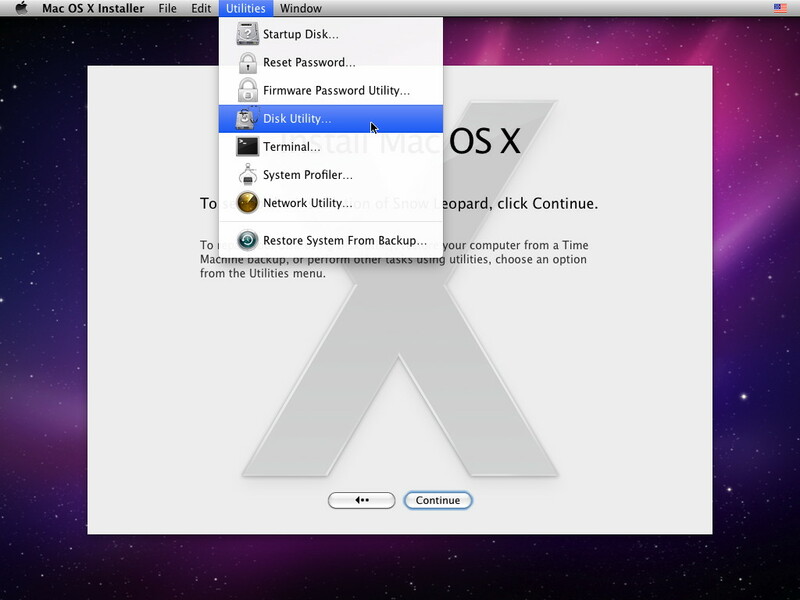 From the menu bar click Utilities>Disk Utility to partition and format the hard drive. These are the options I used. This install was running in VMware Workstation so the 49.95Gb Disk is shown as a SCSI drive, on PC hardware this will have the usual Drive icon. Click the Options button to check the Partition table is correct. I always use a GUID partition scheme on a drive containing only Mac OS. Master Boot record is used if the same drive contains Windows or Linux. My preference is to install the different operating systems to separate hard drives if possible as it’s easier. 4. Once the install has completed boot again from the Kakewalk CD, this time selecting the partition you just installed to. 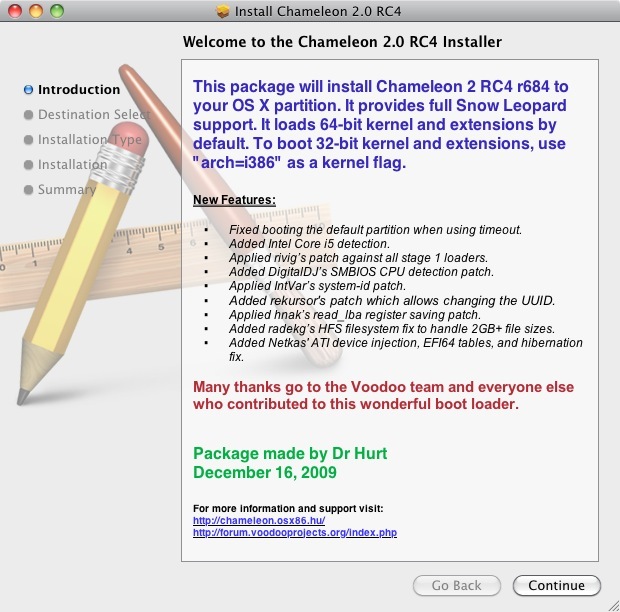 Once the computer/account setup has completed install Chameleon 2 RC4. There are no options with this version beyond selecting which partition to install to, so no incorrect kernel extentions to worry about. 5. Chameleon 2 RC4 creates an Extra folder in the Root of the drive, and the Extensions folder inside this. I re-used the necessary files from my previous 10.6 install, so my hard drive looked like this. boot is installed by chameleon so doesn’t get replaced. Disabled Extra is a folder I made to move kext’s to that are no longer required. 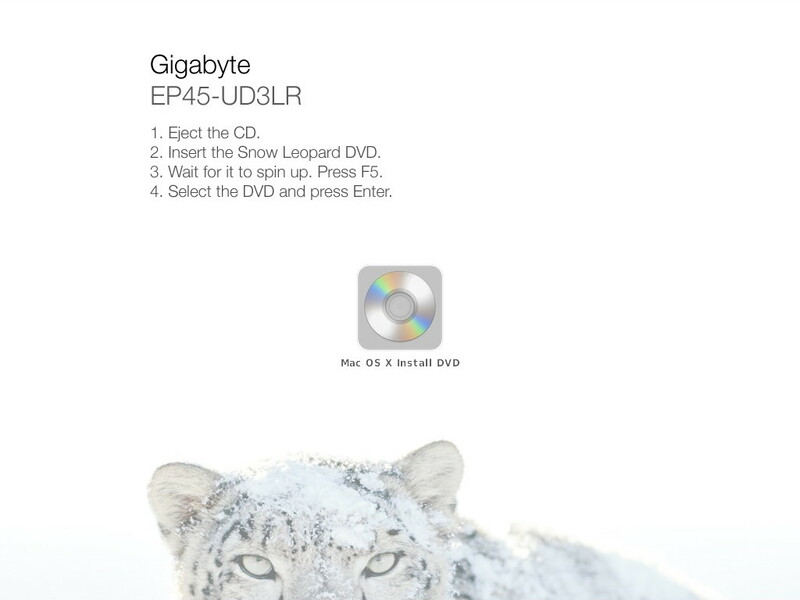 AppleSMBIOS was originally added under Leopard after a problem with iMovie and DVD Player crashing with disk images, but is not needed for Snow Leopard. Extra contains the com.apple.Boot.plist with graphics and ethernet strings, created in OSX86 tools. Chameleon 2 includes a graphics enabler that could probably replace the graphics string for my 9800GT, but this method still works so I’ve stuck with it. The dstd.aml is modified for my system, the first Snow Leopard install guide has links in step 6 that explain how to do this. The bonjour folder contains a version of ifconfig that gets bonjour working, and the command to trigger it. The files in Extra/Extensions are needed for correct operation of Snow Leopard. These will vary on other hardware, so this part is up to the installer to find out what is needed. This time I haven’t edited the PlatformUUID file with my disk identifier and there have been no ill effects so I suspect the file is no longer needed. 6. Next was the upgrade to 10.6.2 using the combo update from the Apple.com site. The original 10.6 SleepEnabler was replaced with the 10.6.2 version from Netkas’ site after the update but before rebooting. 10.6.2 has been working fine for a few weeks now and most of the problems I previously encountered have gone. The boot CD method is quicker, simpler and easier to modify and backup than the previous install method, so is my new standard install type. Never built a hackintosh, but always thought about it. Can you get digital audio out (ie, 5.1, etc) from this build? Yeah I’m wondering the same thing about the audio. Does it work in 10.5 patched? I have a fully working digital output, taking a coaxial feed into a yamaha AV amp for digital surround in films or games. The output had to be switched to digital out (under Windows both analog and digital work together). I have Gigabyte GA-P35C-DS3R motherboard (35C instead of 35), this is almost the same as you have. So, you just used first motherboard (E45-UD3LR) in list of the Kakewalk installation, and everything was fine? I tried that and I got different set of kexts in Extra folder. I’m new to these things and would be thankful for your advices. Should I add|patch some files manually? @ Starush – Kakewalk is a continuously developing package, when I first used it there was only a CD image with all the kexts included. Now there is an installer that creates a custom CD for your choice of motherboard. I didn’t install anything from the Kakewalk CD, just used it to boot the Snow Leopard Install DVD. You may have to try the different motherboard options to see what works. @ Basshead — tank’s. It happens sometimes: I am asking the question and then find some solutions by myself ;-). I already have read your first method about needed kexts, at the moment my system upgraded to 10.6.3. Everything is working (even sleep, i’m enjoying it like a child ;-)), excepting sound and quartz. I didn’t tried bonjour to work yet (not sure if I need it). I tried different kexts, different DSDT (even created new one with DSDT patcher), but unfotunately sound is still silent. Do you have sound working under 10.6.3? @ Basshead – I’ve got the same motherboard, what did you do to get sleep working for ya? I’m running 10.6.4 with everything working perfectly except for sleep! any help would be appreciated. Thanks! @sh33r – OpenHaltRestart.kext and SleepEnabler.kext, as shown in the guide. Make sure your permissions are set correctly on /Extra and kext caches are rebuilt. hi basshead, I got the same motherboard, same cpu except the display card is GTS250 512MB, currently on 10.6.3, and hook up with a 15″ 1024×768 normal display. I just brought a new display but no luck showing any signal (either with on VGA/HDMI/DVI); native display should be 1920×1080. Sound doesn’t work at all. So what I plan to do is to re-install everything from strach. What method do you recommend I use ? a). the link you post above: kakewalk and first install 10.6.0, then upgrade to 10.6.4 ? if so, do I have to backup my currently /Extra folder ? b). if you install from the above said method, did you choose gigabyte EP45-UD3LR (from the image you posted); are this MB identical to the MB we use ? c). at last, could you upload your OpenHaltRestart.kext and SleepEnabler.kext so that I can make my system work ? many thanks. Hi, I don’t even know where to begin with the endless problems I’ve had trying to install Snow Leopard on a PC. I have just bought a Gigabyte x58-UD3R with a I7 950 processor and 2 gig of RAM (for now) and tried lots of ways to get this to work. My first attempt (using a different method to this) was the most successful but when it tried to install, it just got the famous Mac reset your machine screen. After trying other ways, I came across this one and thought I’d try it as it seemed the easiest. Boy was I wrong. I’ve followed everything you’ve said to the T but always get two problems, one of which I do eventually overcome. When I try to put the Snow Leopard image on to the USB stick, it usually bombs and keeps saying restore failiure. I have to try this at least 3 – 4 times before I get any success. Once I finally get the image on and I’ve done all of the jiggery pokery, I try to boot up the Hackintosh using the USB. However, it always seems to freeze on the DMI pool verification. I have noticed that the boot file hasn’t copied across from other installations I’ve tried. Even when I try to copy the boot file over, it still won’t boot. Also, tried the CD version and all I get is a boot error on the disc. Also, I’m using a Mac G5 to do the Mac bits. Can anyone suggest what I’m doing wrong, etc? Curious how you worked this with VMWare? You first set up VMWare then booted off the Kakewalk CD? Now this process is about installing booting from the kakewalk cd and then swapping in between to OX disc and installing leopard and then continuing with the snow leopard install..
What i need to ask is if i already have the leopard 10.5.8 installed can i directly start with step 4 or i need to start from scratch. also my 10.5.8 is working on amd so will the kakewalk work on amd to..?? I am trying to get 10.6.3 on my PC and had all types of issues, I have a gugabyte x48 ds4 mobo and want to try the kakewalk cd…. I downloaded it from their site and unless I am missing something I do not see an ISO file, how do I get this on a cd?? Any help would be greatly appreciated!! This is driving me crazy!!!! Do you need a retail version of OS X Leopard or does a OSx86 download work? I’ve a boot great! BUT I’VE ON UBSCURE? MOTHERBOARD!! thank u for this great software. internet by a USB dongle is probably an option? and Audio? Thnx in advanced and a beer…. Newegg is out of stock!!! Also I was hoping to use MicroATX, but this looks like an up to date article. Thanks. Do you need a retail version of OS X Leopard or does a OSx86 download work ? unique approximately my trouble. You are amazing! raise your own army and lead your clan to victory!